This dish is just fancy-ing up baked beans. My son loves baked beans so I thought I'd give it a go. He loved it. 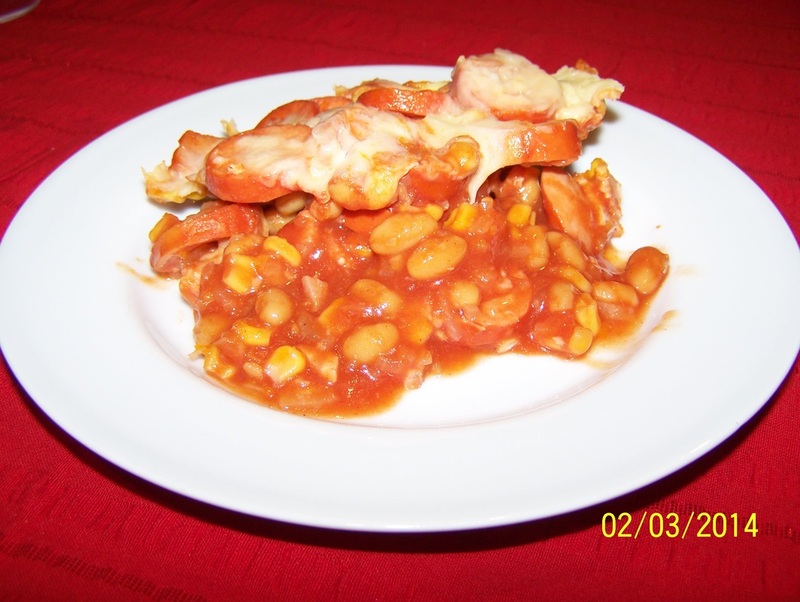 So if you feel like making this, it is really easy, you still has the taste of baked beans, but with the addition of corn, bacon and ham, you get a meal. I quite like it myself, so not completely 'kids' food. I serve it as a side, but you could have some pasta with it as a quick lunch. You can pre make everything up until you need to put the cheese on. Sprinkle on the cheese just before you put it to bake. The photo below was taken when it was cold, as I forgot to take a photo when hot, so the cheese looks hard, but when baked the cheese melts and is really nice. You can add some green capsicum with the onions and bacon if you like, my 7 year old doesn't like it, so I don't add it. Heat oil in a medium sized saucepan. Add onion and bacon, cook, stirring, until the onion is soft. Add the frankfurts to the onion and bacon, cook, stirring, for 1 minute. Add the baked beans, corn, passata and chilli sauce. Stir to combine. Pour the mixture into a shallow (6-cup capacity) ovenproof dish. You can pre-make this up to here. When ready to serve, Sprinkle the cheese over the top. Bake in a preheated 180C oven for about 15 minutes, or until the mixture is bubbling and the cheese has melted. Serve hot.